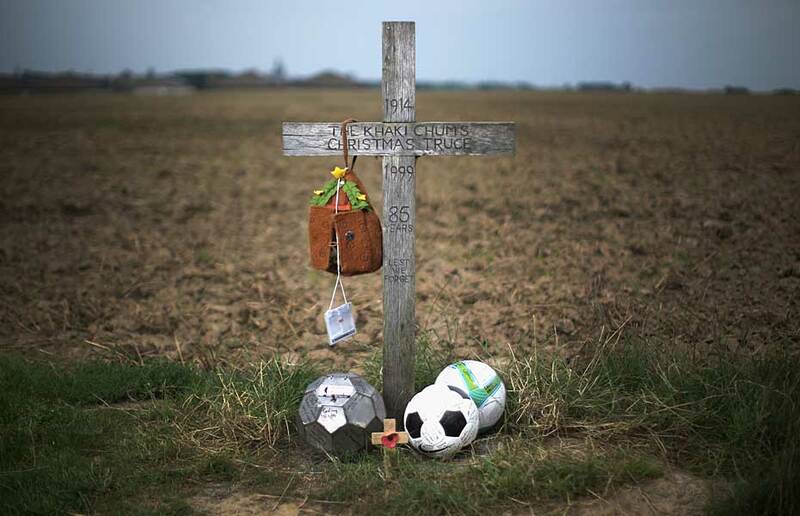 Memorial for the Truce in Flanders, Belgium, where soldiers may have played soccer. “About five o’clock on Christmas Eve the Germans started lighting up Christmas trees in their trenches. We took no notice of them until they began to sing. Then we began to cheer them and to talk to one another as we are only about 80 yards apart.” -Rifleman C. Ernest Furneaux, British Rifle Brigade, January 4, 1915. Along the Western Front in France and Belgium, soldiers waited in their trenches on Christmas Eve. British troops enjoyed puddings and cigarettes from home. Across the fields, sometimes only yards apart, German troops decorated small Christmas trees with candles. Both sides had started singing carols, and could hear their sworn enemies singing familiar tunes. French and British soldiers peered out of their trenches and saw hundreds of lights across the fields when curiosity took hold of them. Despite the language barriers and the months-long war, soldiers crawled out of their trenches, walked into the open air, traded gifts, and sang together. Some even played soccer, with a reported German victory of 3-2. They drank, sang, and celebrated Christmas on the battlefield. Later, many soldiers wrote about these events in letters to their friends and families. “At dawn the Germans displayed a placard over the trenches, on which was written Happy Christmas, and then leaving their trenches unarmed they advanced towards us singing and shouting ‘comrades!’ No one fired.” -Unknown Belgian soldier, January 4, 1915. The Great War began in August, 1914, and was expected to end before Christmas. By December, it was clear the war would drag on. Soldiers found themselves in appalling conditions. Sanitation was poor, food was scarce, and enemy gunfire was frequent. So, far away from home, threatened with death and disease, cold, hungry, and probably confused, many German, French, and British soldiers decided to stop fighting. “The British burst into a song with a carol, to which we replied with ‘Stille Nacht, heilige Nacht.’ It was a very moving moment, hated and embittered enemies singing carols around the Christmas tree. All my life I will never forget that sight.” -Josef Wendl, German soldier, January 1915. In some places, the Truce lasted until Christmas morning. In others, it lasted until New Year’s Day. Soldiers shared whatever food and drink they had, took the opportunity to bury their own dead, and befriended the men they were expected to kill. Some even joined together in a Christmas Mass on the battlefield. Suddenly, the Germans were no longer monsters trying to dismantle civilization; suddenly the French and British were not the greatest threat Europe had ever known. “Friend and foe stood side by side, bare-headed, watching the tall, grave figure of the padre outlined against the frosty landscape as he blessed the poor broken bodies at his feet. Then with more formal salutes we turned and made our way back to our respective ruts.” -Unknown British soldier, January 15, 1915. The ceasefire was spontaneous, informal, and technically illegal. Soldiers were forbidden from fraternizing with the enemy, which was relatively easy when trenches were so close, and such interactions sparked sympathy. Though common then, such fraternization is rare today. In contemporary wars, it is easier to dehumanize the enemy because there are broader cultural differences. American troops during the Korean and Vietnam wars were told they alone prevented the spread of communism, and those Americans who celebrate Christmas now find it difficult to share that holiday with the mostly Sunni Muslim communities of Iraq and Afghanistan. Propaganda dehumanized communists as the negation of American values and contemporary media frequently call Muslim societies the antithesis of western culture. “Further, they agreed that if by any mischance a single shot were fired, it was not to be taken as an act of war, and an apology would be accepted; also that firing would not be opened without due warning on both sides.” -Unknown Irish soldier, January 2, 1915. But dehumanization is only a process of denial. No matter how well we deny it, everybody in the crosshairs is a human being. They all have families; they are all lost and confused and angry and shaken. It’s easy to deny the humanity of an Iraqi or a Korean whose language and culture we do not understand. But just like all Americans, they work like us; they make music like us; they bleed and yearn and gasp for one last breath like us. The trenches were hell on Earth. Nevertheless, people chose to celebrate Christmas in hell. They chose to recognize their mutual humanity and stop their mechanized slaughter. We can learn from the Truce that peace is actually quite simple. All we have to do is realize that, no matter who we’re fighting, all we really want is good food, good music, and good company. If we all stopped listening to the propaganda and acknowledged how much we long for home, maybe we can stop the nonsensical industry of warfare. It may sound preposterous, but the letters prove that such an act, however brief, has a historical precedence. Who’s to say it can’t happen again? This entry was posted in History, Philosophy, Theology, Aeasthetics, and Politics, Writing and tagged Belgium, Carols, Christmas, Christmas Eve, Flanders, France, Germany, Joyeux Noël, Peace, Propaganda, Schöne Weihnachten, Silent Night, Stille Nacht, Trenches, War, Weinacthen, World War One, WWI on December 24, 2014 by keeneshort. Best Xmas post I’ve read this festive season!